A creative design called stamped concrete is a result of compressing rubber mats to produce a pattern similar to brick or stone. This procedure is very effective in creating beautiful designs for your poolside walkways, ponds, porches, patios and driveways. 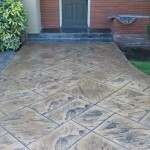 Stamped concrete will turn an otherwise ordinary walkway, patio or driveway into a work of art. 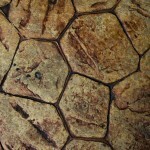 We can create surfaces that resemble brick, cobblestone, flagstones and even tile. And using concrete as a building material is very cost-effective. We can even make interior heated floors that look like hardwood, but last much longer. The reason for using colored concrete and stamped concrete when planning patio ideas is simple… The almost endless choice of colors and patterns that can be chosen. 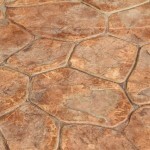 Second would be durability of the decorative concrete. 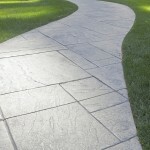 You want your patio or driveway to be an investment in your property. Increasing your resale value and improving the overall look of your home. 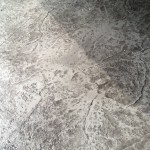 Stamped Concrete is without a doubt an investment in your property and you probably would like to protect your investment. The solution to accomplish this is simply to keep it coated with a concrete sealer. This prevents water and other materials from penetrating the exterior and accumulating in the pores of the concrete. 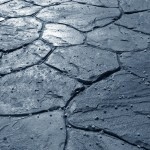 How do you recognize when it’s time to reseal your concrete patio? 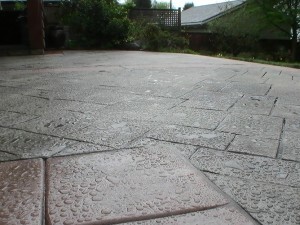 When your concrete driveway or patio looks much better when it is wet instead of dry or the concrete readily absorbs water and darkens the instant it becomes wet, it is time to re-seal your slab. Wash the area, let it dry, and apply a coat of clear concrete sealer using a roller. Using a roller is generally the preferred procedure since you get a more even application and also you don’t need to worry about getting overspray on the sides of your home. For a lot of surfaces this should be performed every two or three years based on the amount of traffic it gets. 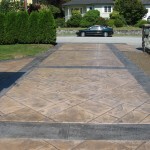 Since driveways are high traffic areas they may require an annual application for greatest protection. 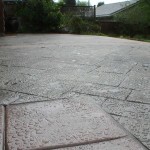 A bit of maintenance on your stamped concrete patio will definitely protect your concrete, refresh its looks, and make cleaning of any stains or debris much easier.